An extraordinary excursion exploring the southern part of the island, where the nature offers incomparably beautiful spectacles such as volcanic lakes and craters, waterfalls and fascinating geological phenomena, as well as the skilful crafts of the Mauritian population. There's no better way to say goodbye to Mauritius before arriving at the airport. Leaving the port by coach, we set off to explore the south of the island. 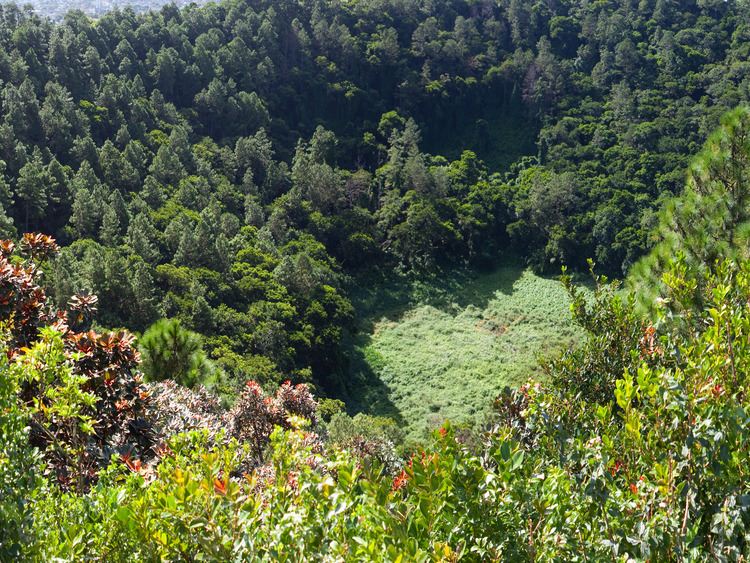 The island of Mauritius has a rich collection of vestiges of its volcanic past, and our first destination is the Trou aux Cerfs crater, on the summit of an extinct volcano, from where we can enjoy spectacular views of the island and mount Rempart in particular. We'll then stop at the showroom of a naval modelling workshop, renowned for its little models of historic crafts based on the original designs. We can browse the objects on display and perhaps even buy an original souvenir. The next stop allows us to come into contact with one of the populations that make up Mauritius' characteristic melting pot: the sacred lake of Grand Bassin, nestling in the crater of a volcano and embellished with a Hindu temple where a famous statue of Shiva is kept. The lake and the temple are one of the oldest Hindu pilgrimage destinations. According to tradition, the lake emerged from a drop of water from the river Ganges which dropped from the clothing of the god Shiva, fascinated by the island's beauty. During the journey to our final destination, we'll stop to take photographs at the Black River panoramic viewpoint, from where we can admire the Black River Gorge, the deepest gorge in Mauritius. Our last, unforgettable stop will be at a magical place: the Chamarel waterfalls and the Seven Coloured Earth. A true natural spectacle: the multicoloured volcanic rocks (red, brown, indigo, green, blue, purple and yellow) are naturally arranged in a tidy design with seven shades that not even torrential rain and adverse weather conditions can eliminate. We return to the coach and head for the airport, accompanied by our wonderful memories of this extraordinary day. Au revoir, Mauritius! In order to enter the temple, participants are required to remove their shoes. The vehicles used in this excursion vary in size, and some may lack air-conditioning. It is not possible to observe the local artisans at work in the model-ship workshop on Sundays. This excursion is reserved for guests who are leaving the ship at Mauritius and whose flights are scheduled to leave later than 16:00. There is a limited number of English speaking guides; should no guides be available excursions will be led in French.